Packed with flavour and nutrients, fresh vegetables are an important part of our diet. And, as our guide shows, there's more than one way to enjoy them at their best. The taste of fresh, perfectly cooked vegetables is one of life's great pleasures - which is just as well, as we all know that vegetables are an essential part of a healthy diet. To get the full nutritional benefit, cook vegetables as lightly as you can, and as soon as possible after buying them, as this helps to retain not only the flavour, but also the valuable nutrients. As any nutritionist will tell you, eating a wide variety of foods is essential for good health, so take advantage of the abundance of fresh produce available at Waitrose, and try something new. Here are our favourite methods of cooking vegetables, along with some simple yet tasty recipes that make the most of these techniques. Boiling is fast and easy to control. The secret is to use as little water as possible and avoid overcooking so all the vitamins and flavour are retained. For vegetables such as broccoli, cut into equal-sized pieces. Add to a pan of boiling water, quickly bring back to the boil, cover, then simmer until the vegetables are just tender. To evenly cook potatoes and other starchy roots, such as parsnips and carrots, place in cold water and boil them gently to allow the heat to diffuse through the vegetables. 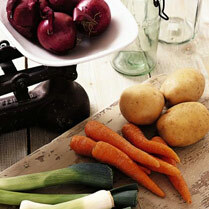 Steaming vegetables is the best way of retaining flavour, colour and vital nutrients. Just be careful not to overcook them as this will make them limp and tasteless. There are two ways to steam vegetables: either place them loosely in a steamer and cover, or to steam them in their own juices, wrap in baking parchment or foil then cook in the oven at 180°C, gas mark 4 for 20 minutes until tender. This last technique is ideal for delicate produce, such as asparagus and baby vegetables. Blanching is a technique used to soften vegetables, either to remove their raw edge before adding to salads or to loosen skins on foods such as tomatoes or shallots. Vegetables should also be blanched before they are frozen, as this destroys the enzymes that cause deterioration. Just add vegetables to a pan of boiling water, return to the boil and cook for one minute. Then plunge the vegetables into iced water to stop the cooking process. Drain and pat dry with kitchen paper before using or freezing. Roasting isn't just for potatoes - root vegetables, squashes and tomatoes all taste wonderful cooked this way. Roasting works by intensifying flavours and causing natural sugars to caramelise, creating a crisp outer coating and a tender centre. For the best results, preheat the oven to 220°C, gas mark 7 and if you're using root vegetables, preheat the cooking oil for a crisp finish. Cut large vegetables into even-sized chunks and toss in olive oil and fresh herbs, if you wish. Stir-frying uses very little oil and cooks vegetables quickly, so they keep their texture and taste. Cut the vegetables into small, even-sized pieces, add a little oil to a preheated wok or frying pan and heat until just smoking. Start with the vegetables that need the longest cooking and keep stirring as they cook. Don't overfill the pan, as they will steam rather than fry - cook in batches instead. If you are adding a sauce, do so at the very end, then toss to coat and serve immediately. Griddling and barbecuing are direct heat cooking methods, which produce vegetables with a crisp coating and a tender centre. For the best results, make sure your barbecue or griddle pan is hot before you start. Slice the vegetables so they sit flat in the pan, then brush with a little oil. Avoid pricking them while they are cooking, as this will release their juices and dry them out. To get the chargrilled stripe effect, don't move them as they cook - just turn them once.